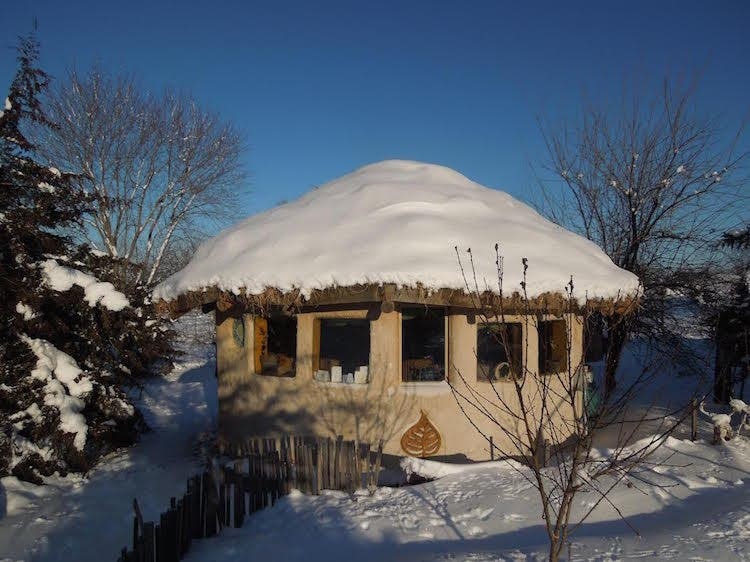 Hassan Hall, natural builder and self-styled woodsmith, combines permaculture principles with an ancient, artisanal approach in his ecologically sustainable homestead: the Hermitage. 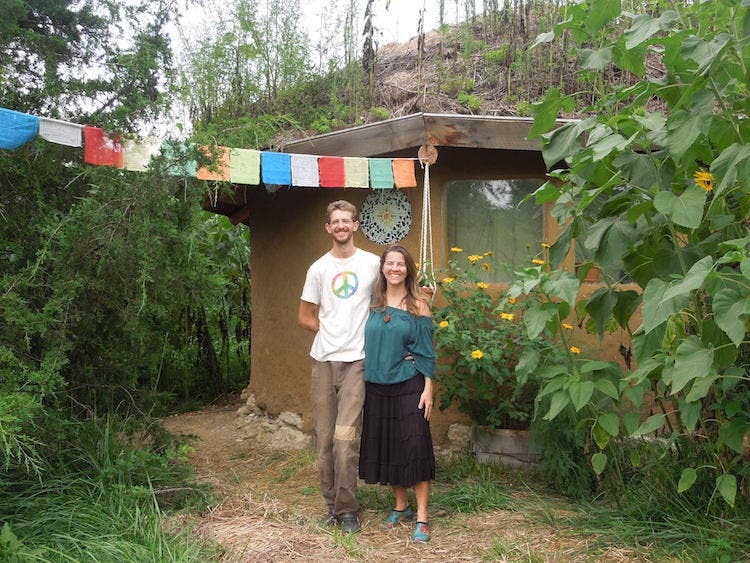 Tucked away on the wild margins of Dancing Rabbit Eco-Village amidst a riot of herbs and flowers, the Hermitage is a much beloved home and sanctuary for Hassan and his partner Danielle, a shamanic practitioner, while they prepare to have children and pursue their vision of right-living using the model of ecological sustainability. 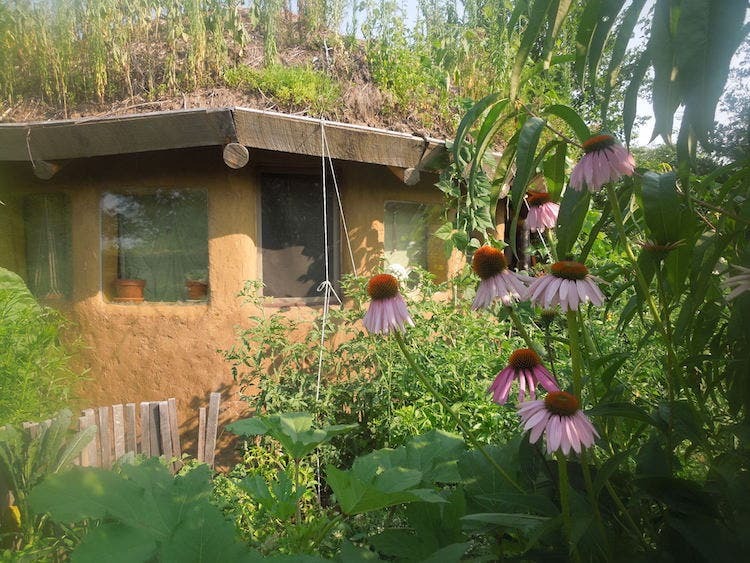 It is a testament to the potential of natural building technology, made entirely of recycled, upcycled and locally harvested materials. The Hermitage rests on a gravel-filled trench embedded with a perforated drain pipe, which guides water away from the foundation and into the back garden. The gravel is capped with urbanite, (concrete rubble collected from demolition projects in the city,) allowing the foundation to stand strong with the use of only a single fifty-pound bag of Portland cement. 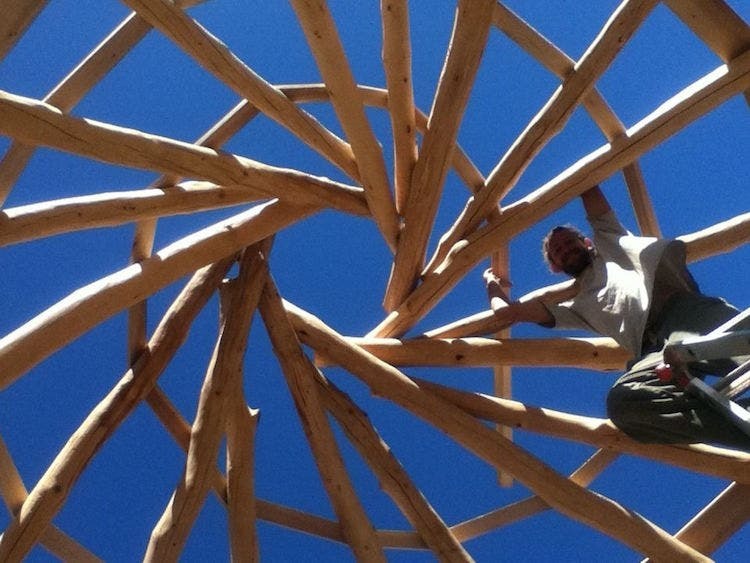 Repurposed wooden skids, (platforms used in the commercial shipping industry,) have been joined together with locally milled lumber to form an almost-round polygon that makes up the skeletal framework of the building, which was then infilled with upcycled rigid foam and light clay straw, (a mixture of dry straw and clay slip,) to insulate the structure. The walls are clad inside and out with heavy clay cob and finished with a paint-like plaster called an alis, which consists of finely sifted clay and cattle manure, all harvested nearby, with a dash of decorative pigment and linseed oil to harden it and improve its water-shedding capability. The walls have an R-value of 32. 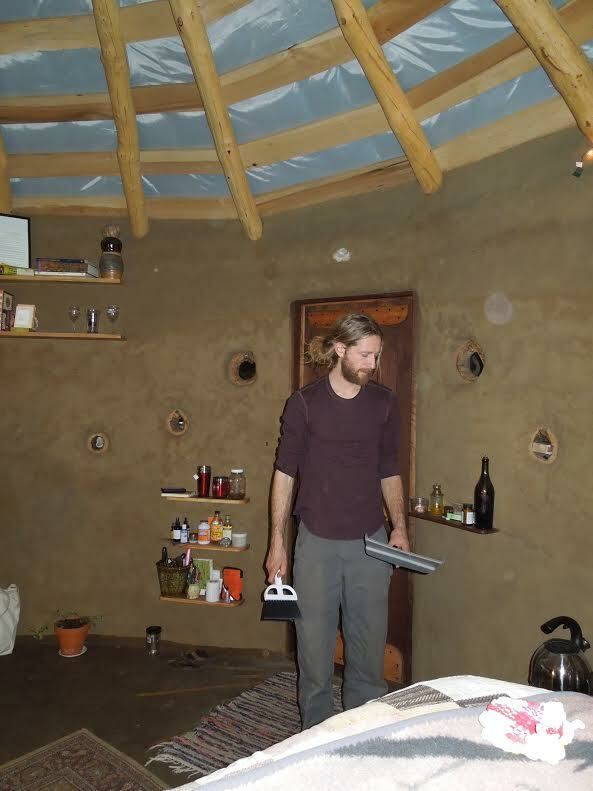 The overall interior floor space is 213 square feet of traditional earthen floor, but feels much larger due to the placement of furnishings against the walls, leaving ample room in the center for morning yoga practice and to work on projects throughout the day. The door is Hassan’s masterpiece in oak and walnut, studded with square iron nails forged by a local blacksmith. Five large bay windows on the west side of the structure invite natural light and warmth into the space. Recycled pallet-wood decking was installed in between the rafters to support the layers of materials that make up the roof, listed here in order of outermost to innermost: straw mulch, an EPDM pond liner, rigid foam insulation and cerulean blue fabric that mimics the sky and gives the space a splash of color without the need of toxic paint. This assembly of materials provides an R-value of 70. Winter heating needs are met by the use of a cast iron wood stove, purchased from a neighbor for a whopping $25 – the family burns about two-thirds of a chord of firewood each year to maintain an interior temperature in the 70s. A custom window serves for summer ventilation. It can be articulated in various ways, sometimes opened just a few inches, other times opened wide, or even removed from the wall altogether. When I visited Hassan at the Hermitage, I was struck by the building’s abundance of personality. The interior of the space is filled with scores of pictures and works of art, colorful geodes and various elements of nature. To me the building resonates in a way that I associate with the sacred spaces of our remote ancestors, like the great halls of the Stone Age Fertile Crescent with their hand-sculpted busts of clay, or the ornately plastered tenements of Çatalhöyük. Careful design and creative intention have transformed this humble homestead into a temple that honors the spiritual dimension of the mundane. 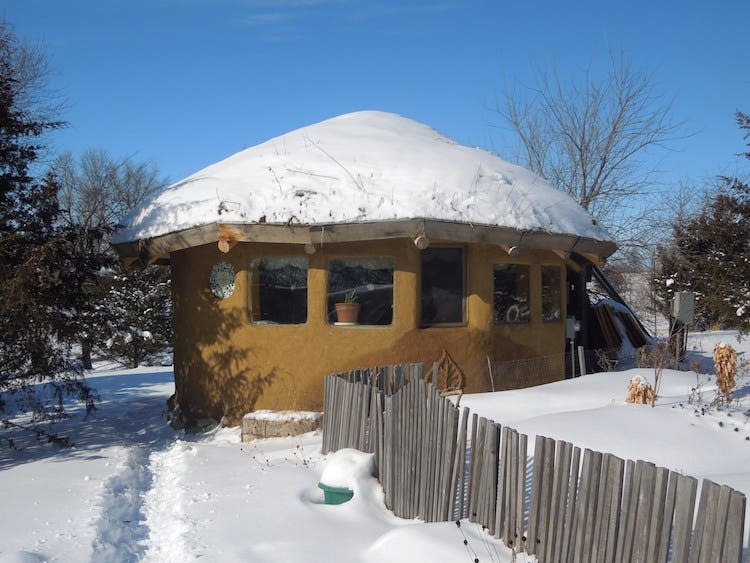 If that house can withstand a Midwestern winter, then I’m very impressed. 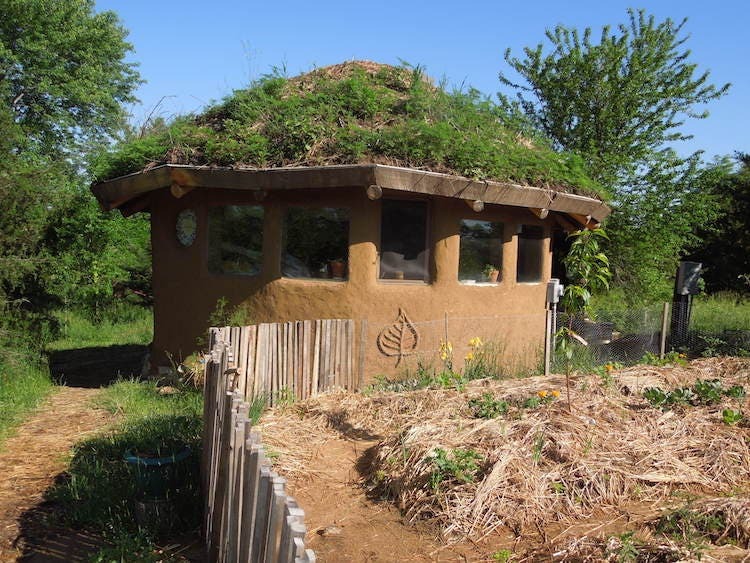 But…this might seem a silly question, but…what’s it smell like inside, with clay walls and earthen roof and so on? Doesn’t the roof get mold in it? 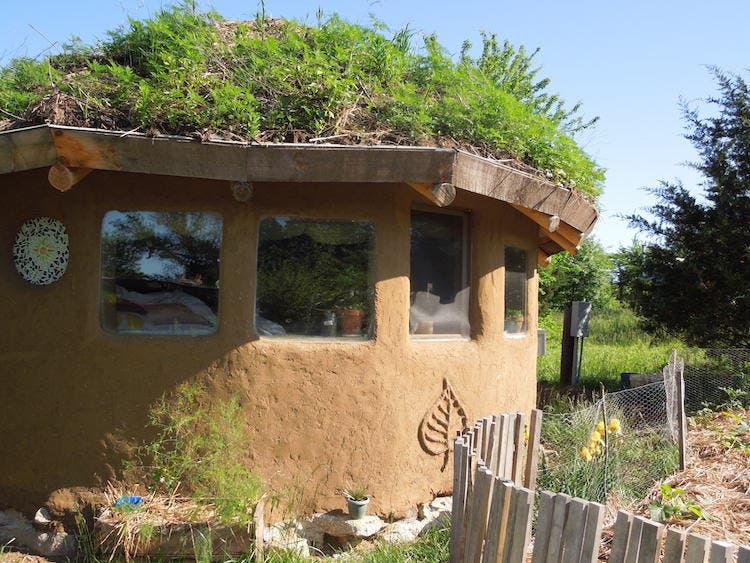 Earth buildings have a wonderful natural scent…at least in the high deserts where I am accustomed to residing in them. This is a magnificent example of cob…very well done!!!! Outside is creative. 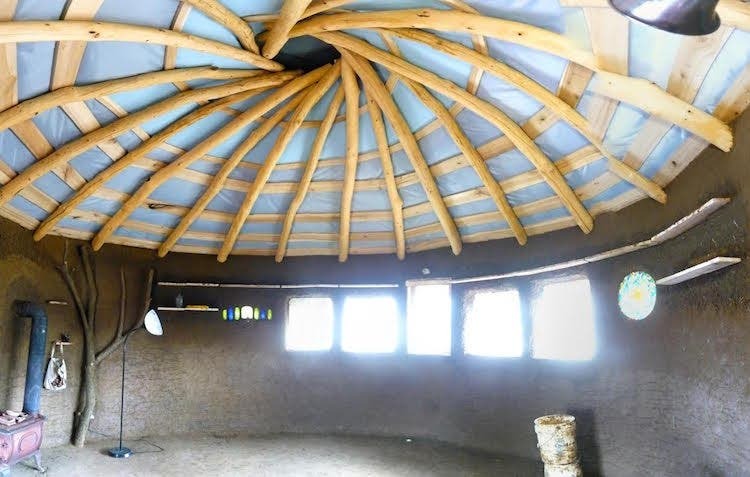 Roof structure is amazing, but was the inside done when these pictures were taken? Pretty barren and cold looking. Good morning Hassen. 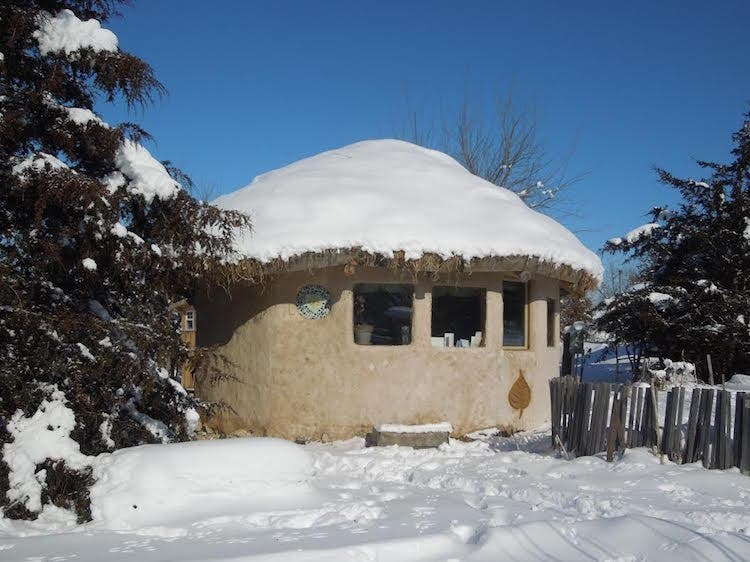 I was wondering if you would be interested in doing some consulting work with me on my design of my strawbale house in N AZ. My designer has some specific concerns & I want to provide the best affordable solutions for these concerns. I would greatly appreciate your valuable inputs.